A park ranger walks past a paraphrased quote the National Parks Service plans to remove from the Martin Luther King Jr. memorial. Interior Secretary Ken Salazar endorsed a plan Tuesday to remove a disputed inscription from the Martin Luther King Jr. Memorial, rather than cut into the granite to replace it with a fuller quotation. Salazar said he had reached an agreement with King's family, the group that built the memorial and the National Park Service to remove a paraphrase from King's "Drum Major" speech by carving grooves over the lettering to match existing marks in the sculpture. Memorial sculptor Lei Yixin recommended removing the inscription this way to avoid harming the monument's structural integrity. Critics including poet Maya Angelou complained after the memorial opened in 2011 that the paraphrased quotation took King's words out of context, making him sound arrogant. 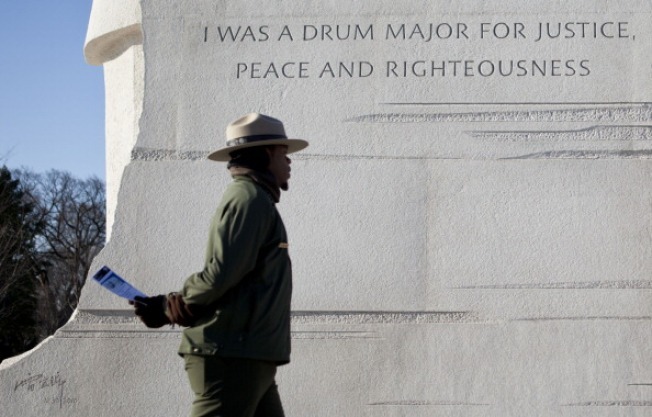 The paraphrase reads: "I was a drum major for justice, peace and righteousness." Yes, if you want to say that I was a drum major, say that I was a drum major for justice. Say that I was a drum major for peace. I was a drum major for righteousness. And all of the other shallow things will not matter." In a statement provided to The Associated Press, Salazar explained the resolution of the long disagreement over the inscription and how it should be repaired. "I am proud that all parties have come together on a resolution that will help ensure the structural integrity of this timeless and powerful monument to Dr. King's life and legacy," Salazar said. Work is scheduled to begin after the presidential inauguration, which falls on the King holiday, to commence in February or March of 2013 with completion expected in the spring, according to federal officials. 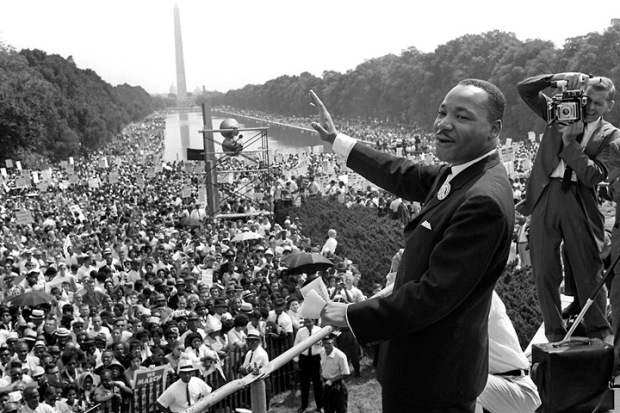 The National Park Service expects thousands of people to visit the site around the time of King's birthday in January and didn't want to obstruct their views. Federal officials will submit plans to two panels that must review and approve the design work. Lei, the original sculptor, will perform the stone work to remove the inscription. The memorial will remain open to visitors during the project, though the statue of King may be obstructed at times by scaffolding. In a joint statement released by the U.S. Interior Department, King's family voiced support for the new plan. King's youngest daughter Bernice King, who is chief executive of the King Center in Atlanta, thanked Salazar and the National Park Service for taking "care to maintain the spirit and appearance of such an important monument to our country's history and my father's memory." King's sister, Christine King Farris, said the family had wanted the entire quotation to be inscribed in the memorial. "While our family would have of course preferred to have the entire 'Drum Major' quote used, we fully endorse and support the secretary's proposal," she said. The group that built the memorial said it was pleased with the compromise of removing the inscription. Ed Jackson Jr., the memorial's executive architect, told the AP that the lettering will be replaced with horizontal "movement lines" that are already part of the design to show the movement of the central "Stone of Hope" out of a "Mountain of Despair" behind it. The design was inspired by a line from King's "I Have a Dream" speech: "Out of the mountain of despair, a stone of hope." That message is inscribed on the other side of the sculpture and will remain. Cutting granite out of the sculpture and replacing it to make way for a longer quotation would have looked like a "patch job" forever, Jackson said. Removing the inscription retains the integrity of the artwork, he said. "We had put forth this idea over a year ago. It took a while for everyone to come to an agreement that everyone could live with," Jackson said.